SUPER DRIFT DAMPER is made exclusively for drifting; developed for uncompromising people who would like to swing the car more freely, to enjoy real drifting to the extreme, and/or to lower the ride height. We have renewed, revised and reset our Type HE damper to meet the demand of remarkably growing ‘drift market’. We are now confidently releasing SUPER DRIFT DAMPER for serious drift drivers, emphasizing more than ever on drift control at high-speed. SUPER DRIFT DAMPER was developed to specifically enhance drifting performance, and we have succeeded in bringing drifting controllability to the extreme by securing a proper bump stroke at a lowered height. 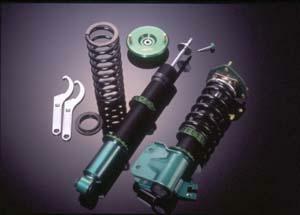 It can fully exhibit its performance in grip driving, utilizing various features. SUPER DRIFT DAMPER is set up for the optimum performance with widely-used bigger tires / wheels, according to each vehicle models.